Banat’s “St. Theodore Wine Order” was established in year 2005, during grape harvest in town Vrsac which is the largest and the most famous wine region in the country. Name “St. Theodore” originates from Banat’s Bishop St. Theodore who was initiator of uprising against Turkish Empire in 1594 in Banat region. In 1994 he was proclaimed as Saint by Orthodox Church. 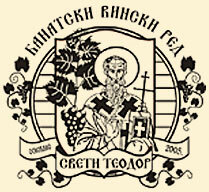 Nowadays Wine and Bishop are distinctive symbols of town Vrsac which was the reason for the Knights of Wine Order to name our Order by this Serbian saint. “St. Theodore Wine Order” has its statute and code of conduct. In some of the very first Articles of the statute is written: “…order is the union of wine lovers who each in his own domain and way have to constantly proclaim and develop culture of wine drinking”. Order is of non-profit character and it is not associated to any religious or political organization. Besides the core task, to spread wine culture and influence drinking of fine wines, knights have additional task to introduce Banat’s environmental, gastronomic beauty and customs related to wine growing and wine making (especially white wines of Riesling – for which this region is famous for centuries) to the people in the regions where they live in. In these ways knights of “St. Theodore Wine Order” age giving their contribution to development and drawing of the Serbian wine trails. Code of conduct also prescribes behavior of its knights. With their dress code (suit and tie during important manifestations), appearance, behavior and moderate wine drinking they have to be exemplary to the rest of society. Anyone who is sincere wine lover and wine expert can become knight of “St. Theodore Wine Order” if he is suggested by existing wine knight to the order’s senate. Senate is gathered once a year (every September, during grape harvest) in Vrsac and at the gathering it considers recommended applications. Acceptance and initiation of the selected candidates to “St. Theodore Wine Order” is performed publicly during large wine manifestations. Each candidate is given an exam to pass before being accepted. Exam consists of answering the questions and degustation of fine wine samples. If candidate successfully pass exam he/she receives diploma, knight’s uniform and upon giving an oath becomes equal member and knight of “St. Theodore Wine Order”. The oath which each knight is giving says: “I am the Knight in service of his majesty the Wine and therefore I obey to it with the great respect”. “St. Theodore Wine Order” counts 19 members and practice is to accept in its order only proven candidates, who are distinguished members of society and have a solid knowledge of wine. The order consists of wine makers, famous people from public life, journalists, scientists, artists, actors, etc. Among knights are two ladies and four consuls.